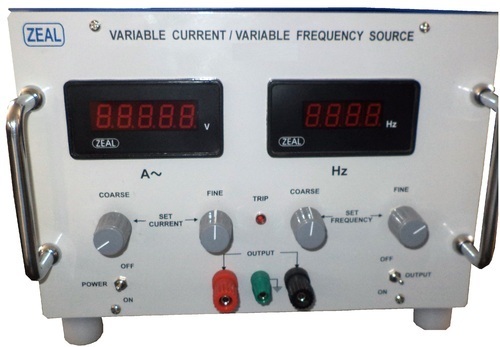 Pioneers in the industry, we offer variable current variable frequency source, decade resistance box and variable voltage frequency source from India. ZEAL Make Precision Variable Voltage Variable Frequency Source has its output range from 0 to 440V with variable frequency 45 to 1000 Hz. Output maximum power is 25VA at FS. The regulation, stability, frequency response and accuracy of the voltage source are excellent. The source can be used for simulation of mains condition & verifying frequency response of devices. Accuracy (%) For 1 Ohm: 0.2%, For 10 Ohm to 10 Mega Ohm: 0.1%, For 100 Mega Ohm: 0.5%. Decade resistance box is made of precision metal film resistors, which are having stability better than 100 PPM. All the decade switches are having very low contact resistance and are of silver plated contacts. 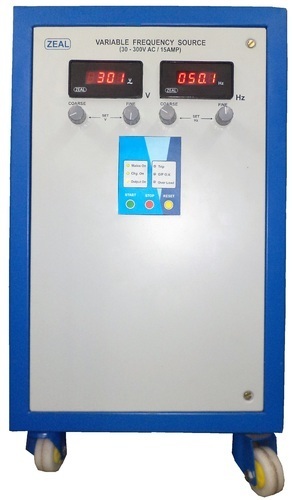 It is designed to calibrate digital, analog multimeters and clamp-on meters for their resistance ranges& it can also be used to simulate the temperature by RTD sensor for calibration of Temp. Indicators or Controllers. Resistors above 1MΩ to 100MΩ decade are designed to handle test voltages up to 1000 V DC, therefore it can be used for calibration of Insulation/Megger Resistance Testers.